Zabaglione and tiramisu may grab all the headlines when it comes to popular Italian desserts but neither possesses a name as intriguing as English soup, or zuppa inglese. Whether the name is the result of its introduction into Italy by English travellers in the 19th century, or its invention in Florence by the servants of wealthy English residents is a question for the historians. All cooks will want to know is, what is it? The answer is that the recipe translates roughly as a trifle; in other words a combination of sliced medium density cake, a custard, or crème anglais, sauce and a judicious amount of alcohol.The spirit used to liven up the zuppa inglese depends upon what is to hand. Some recipes may espouse, brandy, others cherry liqueur. A fortified dessert wine such as marsala could equally do the trick. But in this case, amaretto, an almond-based liqueur from Saronno in the Lombardy region, will suffice. To begin, the dessert, based on servings for six people, make the custard sauce. The yolks of four large, preferably free-range eggs. Check the date on the eggs to ensure that they are the freshest available. 500 millilitres of full-fat milk and the zest of half a lemon. Break the eggs and separate, dropping the yolks into a heavy-bottomed pan and discarding the whites. Drizzle the sugar into the eggs, beating all the time until amalgamated, then repeat the process with the flour until a thick golden mix is achieved. Bring the milk to the boil and begin adding to the egg mix, a ladle at a time and stirring continuously to avoid lumps forming. As the mix begins to become semi-wet, turn on the heat under the pan, drop in the lemon zest and continue adding the milk until it is exhausted. As the custard mix heats up, the flour will begin to cook, thereby thickening it. When a semi-thick consistency is achieved, take the custard off the heat and put to one side. Do not allow the custard to boil as the egg yolks will separate and solidify, leaving you with sweet scrambled egg. Take two blocks of ready-made Madeira cake (alternatively, a packet of Savoyard biscuits would do equally well) and cut into fingers. Brush the cake slices with the amaretto liqueur and line the bottom of a glass mixing bowl with a layer of them, fanning them out from the middle of the bowl. Pour in a generous measure of the custard. Then grate over the custard a blanket of good quality chocolate, preferably Swiss. Follow this with another layer of cake slices, then the custard and grated chocolate and finish with a layer of cake that forms a lid. 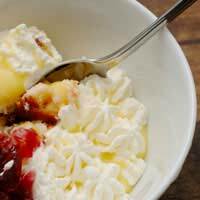 Place the finished dessert in the fridge for about six hours, removing about 30 minutes before serving. The more ambitious could attempt to invert the glass bowl in the hope that the dome will slide out and retain its shape on a presentation plate. But even if the result is a spectacular collapse, this will not affect the delicious taste of the finished dessert.